Yesterday, I ran across a movie titled The Selling on the Chiller cable network. Normally, I don’t bother watching Chiller. It tends to have the blood spewing, goriness that I don’t care for in modern horror movies. But the title — The Selling — intrigued me enough to watch. And I’m glad I did. 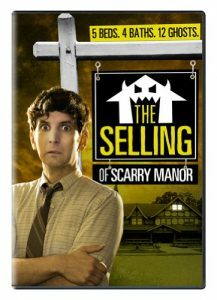 The Selling is a hilarious parody of the haunted house movie, with an honest realtor (no, really) who decides to buy and flip a house to help with his mother’s medical bills — she’s suffering from cancer. So, he and his friend decide to fix up the house. Not realizing that the house is haunted, and it doesn’t want to be sold! raking the haunted yard — complete with a hornet’s nest, etc. There’s also mocking various tropes (the “psychic investigator” who’s actually a waitress, the hilarious “exorcism” scene, etc.). The film moves along at a quick pace, and actually tells a coherent story in the process. I enjoyed The Selling of Scarry Manor and I hope you do as well. When Richard Scarry, a too honest for his own good real estate agent, discovers the house he’s invested in to raise money for his mother’s hospital bills is haunted he learns how scary the house market really is. With the aid of his best friend who refuses to go inside, an exorcist who loves craftsman style architecture, and an eccentric ghost rights activist/blogger/ waitress, Richard gamely tries to get rid of the house and/or its ghostly inhabitants before its too late. But when an evil spirit decides to move out of the house and into his body, Richard discovers he has a whole new set of possession problems.